The Big Q: What Drives Your Spirit? 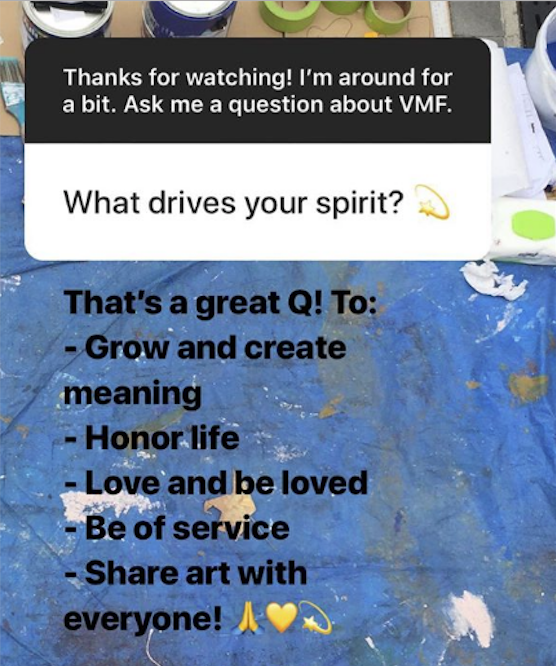 When I test drove the new’ish Q&A feature on Instagram, I was a little surprised with the big question I received when asking if anyone had an inquiry about Vancouver Mural Festival. This question came from someone who I believed would deeply appreciate a thoughtful answer. And if she would value these ponderings, then perhaps others would as well. “What drives my spirit” is a timely question as my word-of-the-year is VOICE. My intention is to deepen, expand and enrich my art practice and life. By seeking out what I want to say, how I want to say it and to whom…I will grow. By following my heart, asking tough questions and taking action, when needed, I will expand. Conversely, patience may be my lesson. And there are always more lessons! Every life has smooth and bumpy patches—and not always in equal proportion. Whatever the lessons, I believe we are on this planet to learn the most we can from every experience. If we are to make sense of things we must create meaning so we can grow and heal, and ultimately lead a life with purpose and passion. Read Viktor Frankl’s Man’s Search for Meaning to dive into this subject. Wow! We are getting to the good stuff here, right?! Everything comes down to love. If it’s not love, it’s not real. And only love is real! I subscribe to the lessons I’ve learned in part through A Course in Miracles and Marianne Williamson’s A Return to Love (a more accessible version) that both inspired Gabrielle Bernstein. We are here to learn how to love and be loved. Sometimes this can be messy or painful. I’m still learning and I’m sure there are more juicy lessons for me to come. Most importantly, I’m grateful for my deep love and appreciation for all; myself, those who I am closest with, those who I don’t know—and even those who have wronged me for they are my greatest teachers. To allow love is a submissive yet equally powerful and graceful. By welcoming love we expand our presence in the weave of life. It starts with self-love. Then, it’s about being okay with being vulnerable. Perhaps it’s asking for help or accepting compassion or appreciation from people who accept you as you are. We are all better together when giving and welcoming love. We each share our gifts in unique ways. Be that a small act of love (a smile or a selfless gesture that benefits a stranger). Or, maybe a self-nurturing act, for if we are not well, we cannot serve. Alternatively, it may be a commitment to raise your children well or improve the world with your gifts. It’s our job in life to figure out how we can best share our skills. Through a heart-centred connection we can ask the big questions that arise from our experiences—how do we serve ourselves, families, our communities, our countries and beyond. We all have value, even if we can’t do anything—at all. There may be times we can only care for ourselves and need the help of others, or need a break from caring so much for others. It is even of service to let someone love you. Think about how another’s joy may be lost when their help is rejected. To me, being of service means aiming to do the right thing and doing all that I can do at any given moment, whatever that may be. 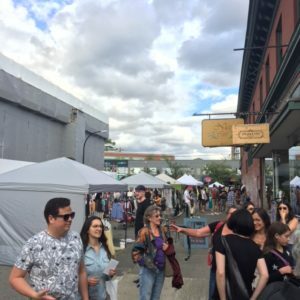 I’m sooo excited about my recent conversation with Richard Tetrault, artist and one of the founding members of the Eastside Culture Crawl (aka The Crawl, a visual-arts festival that receives more than 30,000 visitors to 500 artists studios annually). 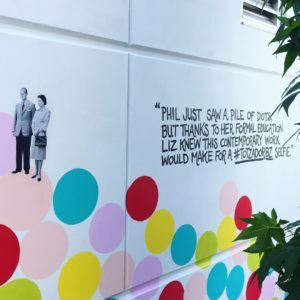 If you’ve ever been to Vancouver you’ve probably seen Richard’s art—his murals can be found throughout the city and around the world. In addition to founding one of Western Canada’s largest cultural events, he’s a super nice, talented, and established printmaker, painter and muralist. He’s even been recognized with several awards including one from the Queen. 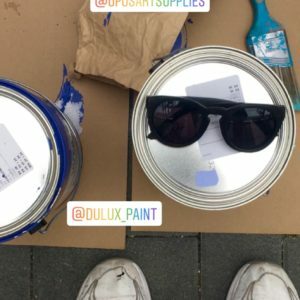 In preparation for my first year in The Crawl, I recently spoke with Richard about his experience as a Vancouver artist. 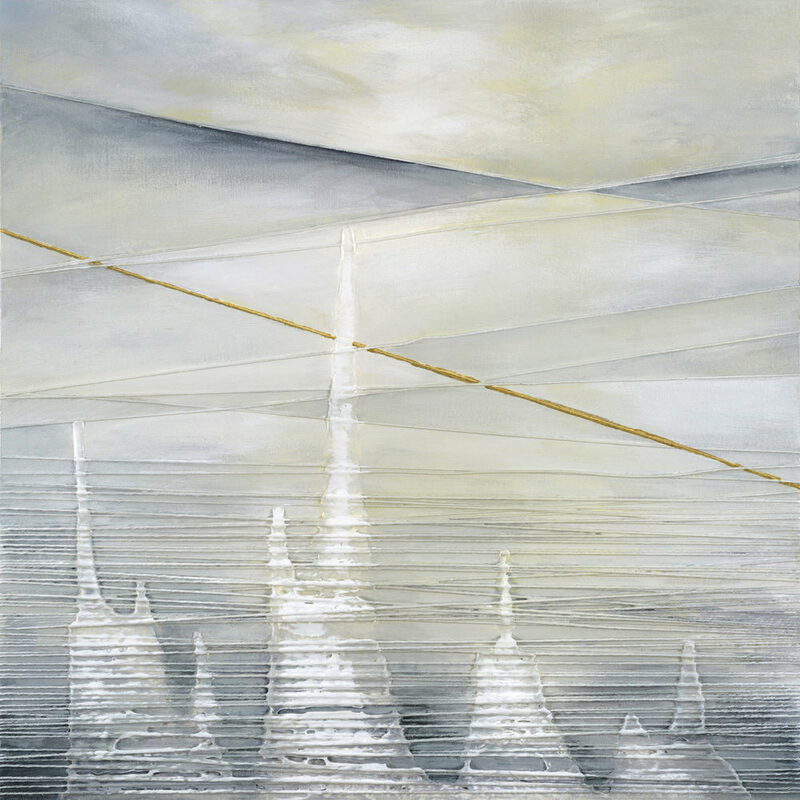 Special thanks to one of my art collectors, Toni Pohl, Realtor, who recently introduced us. 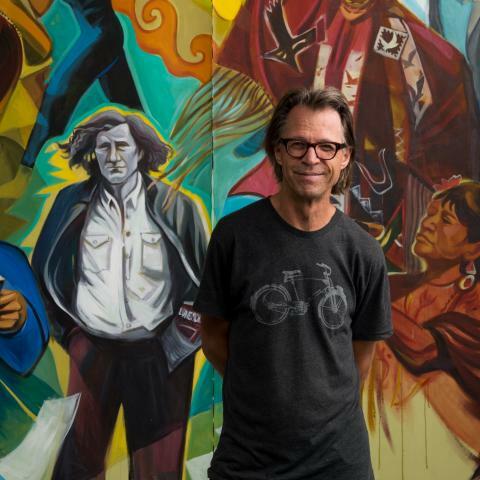 Tetrault with mural “Living on Shared Territory,” a tribute to the artists, activists, people, art and cultures of the Downtown Eastside. I would advise finding a low-cost studio. By keeping your overhead to a minimum, you’re able to focus more on your artwork. This, in my opinion, needs a decade or two. Minimalist is good. You’ve got to have time to focus. Unfortunately, finding an affordable space in Vancouver is getting harder to do these days. Also, if you are lucky to find a good teacher/mentor, you will advance quicker than on your own. 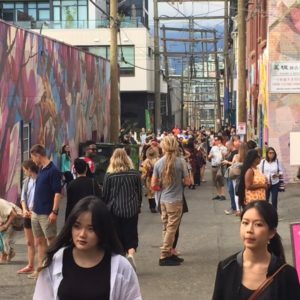 Do you have any suggestions for artists who want to get the most out of the Culture Crawl? The Crawl is an opportunity for artists, but it can’t do it all. See it as an established event that brings hundreds, even thousands to your studio over the course of the event. As an artist, you have to make your show work for you — mount only your best work, make sure the quality is engaging each year, and create an informative experience. Many artists don’t realize how valuable juried shows and competitions are. If you are signed up, you find call-outs for juried shows through the Crawl website. 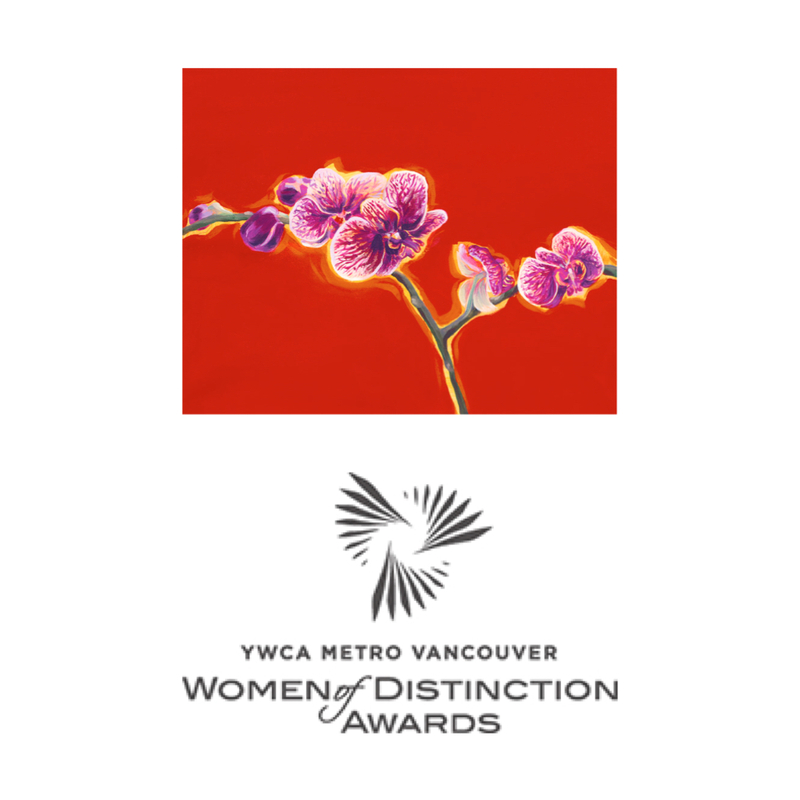 The juried show venues presently include the Arts Factory, Cultch Gallery and Firehall Arts Centre. All provide good opportunities and are a great way to gain additional exposure. 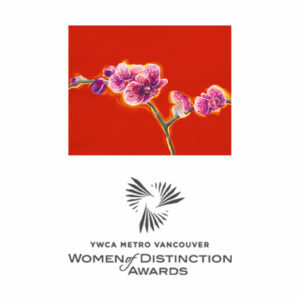 You can use these shows to build your CV, necessary for Canada Council applications and other grants that require a track record of juried exhibits. It’s also helpful to submit your work for the media package through the Crawl–you might get profiled in various media, introducing new people to your work. Volunteering is good too. How important is having a shared artists’ studio space rather than working from a home studio? Networking is essential for artists, even if you are essentially a loner. If you’re not in a shared space you really need to make an effort. In my experience (and much of my career has been in a studio separate from home), the people around me also helped build a community that supported my success. This has included artists, galleries, and public. So in this sense, geography is important. Being involved in the Crawl, or other events — even once a year — can be a big shot in the arm early in your career. For me, it has over the years opened up opportunities for murals and other forms of collaboration. The energy you gain from that is great, and feedback is generally a validation of sorts. It can provide a barometer for insights. How do you source and manage calls for artists? At this point in my career, most of my opportunities come from my built- up contacts, networks, and relationships. 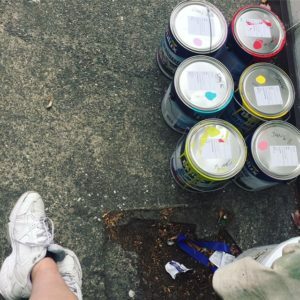 I seldom apply to broad callouts, and when I do it’s generally a public art call through a city in the Lower Mainland, or for an interesting or unconventional exhibition. Starting out was different, and I have shown in many curated, un-curated, conventional and out of the box venues, locally and internationally. I’ve responded to calls for artist residencies, resulting in a 5-month paid residency in Germany in 1993, for example, as well as for exhibitions in Asia, Cuba, Argentina and Croatia, other regions of Canada and the United States. But I pass on more than I follow up on! What are your thoughts about canvas prints? There are a lot of ways to be an artist; in addition to painting and murals, I’m a traditional printmaker. I have learned the skills and discipline of making artist’s prints, from carving a matrix (generally woodcuts) to completing an editioned run. Commercially printed or open-ended prints — or any kind of poster-type prints — are just not a part of my aesthetic and sensibility. I believe open-edition, commercial prints can water down the uniqueness of an original, no matter how cutting edge the technology. Although I have made a couple of exceptions (for example I make postcards as advertising for events, shows, etc.) I think that as an artist you need to ask yourself what your ultimate goal is. Historically, printmaking was the ultimate socialized form of image making and distribution showing us that creating unique prints is a viable way to disseminate visual material. I like the feel of a woodcut…the embossing, overlays, the language of the chisel marks and the gestures that make it a unique thing. Etching, relief prints and lithographs are all original works of art. When I create print runs, I consider the edition size when I price my work (generally keeping editions small, about 5-35 total). Larger runs are more affordable and often reserved for special events. 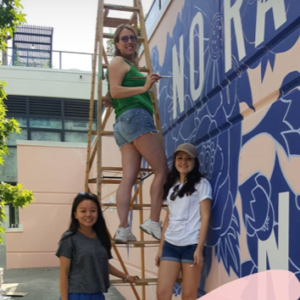 How did you get involved in making murals? I became interested in murals through my extensive travels to Mexico in the early and mid 70s. I was influenced by the great muralists of their tradition, Rivera, Orozco, Siqueiros, and others. At SFU in 1977, I created my first mural in a public venue. It was strongly influenced by the Mexican sensibility and dynamics, but unique to my own iconography. And, most importantly, this started me on a path of doing more murals! 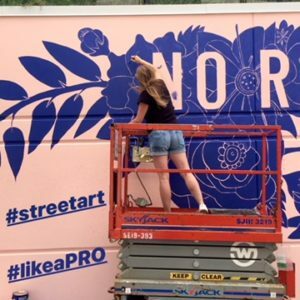 The best cities to see great murals in North America are Mexico City, Guadalajara, San Francisco, Los Angeles, Chicago, Philadelphia and New York — popular murals are in every large city. Vancouver is getting stronger too. I have a great interest in architecture and love seeing how murals can interact with public spaces. 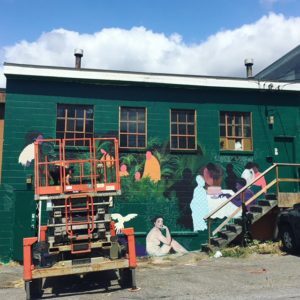 I have a desire to work collaboratively with the involvement of various communities, locally and elsewhere, and murals are a great vehicle for making that happen. I belong to a group called La Raza Artists, through which we do international projects, including murals in Argentina, Mexico, Cuba and elsewhere. As well, my partner Esther Rausenberg and I are co-artistic directors of Creative Cultural Collaborations Society, an organization focused on local, relevant community-based initiatives. These are sometimes murals, but also can be multi-media based. 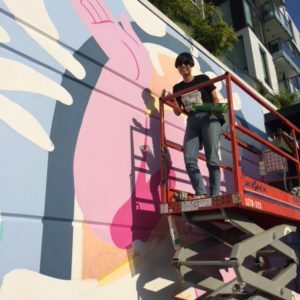 What advice would you give an emerging muralist? 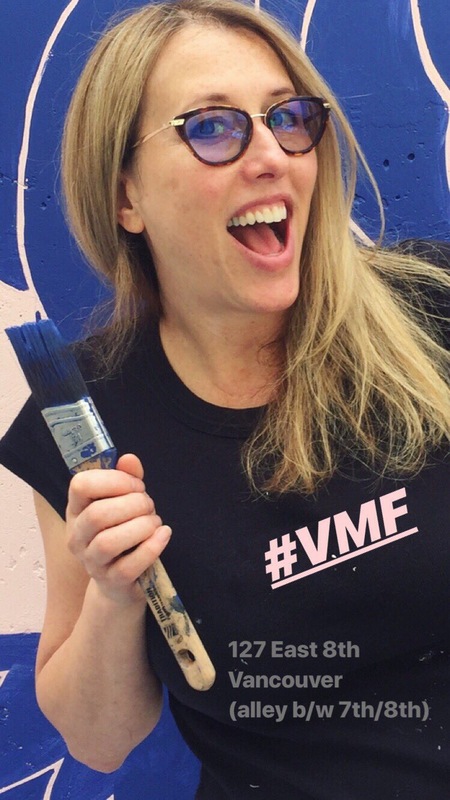 Volunteering for an established muralist is a quick way to get skilled. You need to learn how to transcribe the image to the surface, scale things up, and activate the wall and architecture. There are a lot of technical challenges as well, and not all artists are muralists. It’s kind of a niche. Some muralists are focused primarily on decorative pieces while others, like myself, have a statement to make, whether subtle or overt. I work hard to substantiate and give layers to a theme. I don’t always work alone, nor do I always work in a group, but my favorite is to work with two or three other artists. I might take the lead. It’s important to me that the mural represents or reflects aspects of the community that it will become part of. I do outreach through workshops, using organizations such as community centres as home-base. I have, for example, worked on a series of murals on the Downtown Eastside (DTES) called Walls of Change (1998) that took six months, involved 300 people and covered 12,000 square feet in murals. 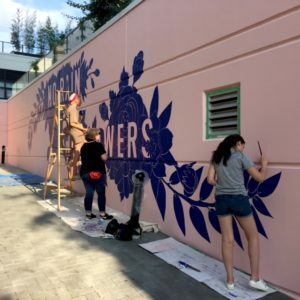 More recently, Radius Mural at the Firehall Arts Centre courtyard, (2013) reflects the history of the DTES and the cultural intersections that make it so rich through the stories of the Japanese, Chinese and Aboriginal people who live there. Have you had other jobs? Yes, in the 70s and 80s I had several other jobs. Actually, I have had more than 45 different kinds of jobs in my ‘art career’! I’d work all day at my day job — that may or may not have anything to do with art — and then work at night on my art. Life is about capitalizing on your challenges and the skills you gain along the way. All these seemingly disparate jobs have provided something valuable to my career. I lived well below the official poverty line ($24,949 CAD, 2018 LICO Table) for the first two decades of my artistic career. Artistically, momentum is really important. You’ve got to keep dedicated to advancing your artistic expression every day, month, year. Sometimes artists get disillusioned because they are inactive for a while, sometimes even a few years. They might ask themselves if this is a career or something that they are just ‘doing’. And what makes it a career, more than the financial returns, is the degree to which you identify and live as an artist. Not that selling work isn’t important, as it is. But at least early on, just keep going, so long as you find substance in the work you are doing. Just be in it for the artistry, adventure and sense of discovery in being an artist. That’s the reward! What are you working on? What’s coming up? 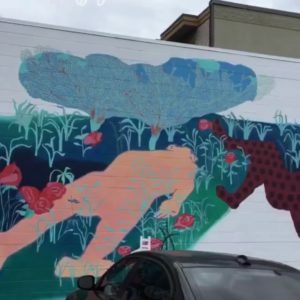 I’m working on a large community-based mural on Commercial Drive at the York Theatre that is thematically focused on the First Nation’s presence past and present, in this city. It revolves around a central figure of a beat-poet singer. 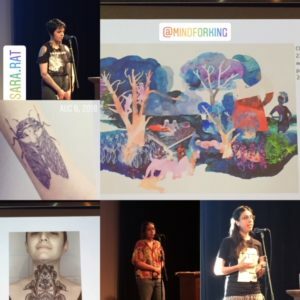 I’ve been collaborating with people from The Cultch and local youth, as well as two of my friends who are excellent artists and fearless on scaffold and lifts, Sharifah Marsden and Jerry Whitehead. After that, I’ll be working on a mural for the Women’s Centre downtown. This will be an interesting challenge, and we are excited about the possibilities of transforming the Atira building into something bright and meaningful in the urban landscape.